The extra time scenario in soccer explains the turn of event in the Osun state gubernatorial election, when the INEC gave a verdict of inconclusive result on September 22. Extra time in the game of soccer is the most unpredictable period in a keenly competitive match. This is because there may be twist of fate for a team which appears to be strong during the full-time to fall during this critical moment while the least expected team become triumphant. During the extra time, coaches and their teams re-strategise and sometimes make substitution. The psychologist has important work to do during this period as he/she has to boost confidence in the ‘boys’ that they are not far from victory. Extra time has lesser time, for the twenty-two players to find the net of their opponent. The fans are also important as their support energises their darling team to victory. The referee must be up to the task in order not to further heighten the tension already created by the no-winner 90-minute full time. The extra time scenario in soccer explains the turn of event in the Osun state gubernatorial election when the INEC gave a verdict of inconclusive result on September 22. 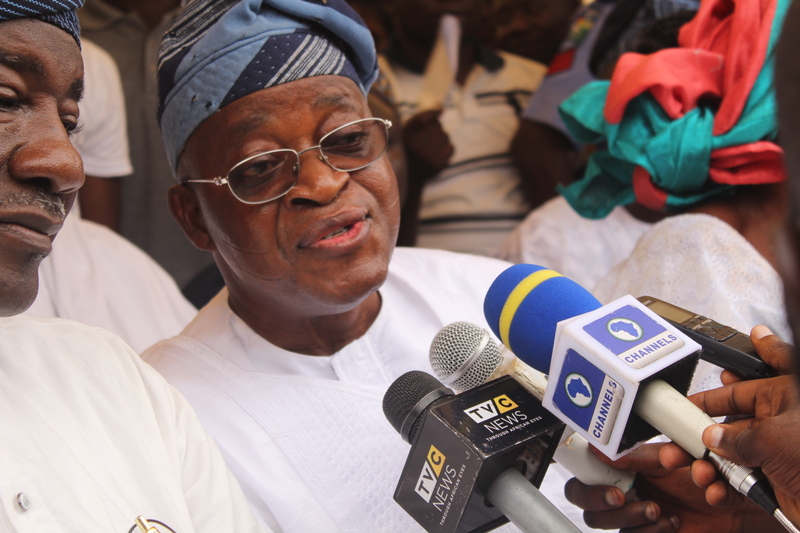 The pronouncement in Osun State has introduced an extra time into the battle between the broom wielding Gboyega Oyetola and the Umbrella-protected underdog, Ademola Adeleke. As things stand, election victory is hanging and these players would need further consolidation during the extra time to clinch the number one position of ‘O-shine’ State. The election had 774,147 accredited voters with 720,122 valid votes. But only the PDP and APC are on the path to victory. This happened even after both teams in the Osun champions’ league utilised ‘innovative’ strategies to win, including online and terrestrial means to buy vote and voters. Clearly, both parties shirked in their duties to educate those who will bring them to power which explains why over 40,000 votes were rejected. Of the total vote of about 767,955, Davido-backed Adeleke polled 254,698 while Wasiu Ayinde (KWAM 1)-supported candidate Oyetola of the APC polled 254, 345. The difference between them is 353 but over three thousand votes were cancelled by the referee who has now taken the match into extra time. INEC is demanding a convincing victory from either of the two teams. Taking the match to extra time was hard to announce even as the decision received voice protest from Team ‘Davido’ who chanted e ma dami duro (don’t delay my victory). He and his Team members see no reason to take the match into extra time. It is too late in the game to shout. I see no need for taking this championship into extra time had the opposition not display arrogance, greed and ego by refusing to work together to achieve a landslide victory. Obviously, majority of the voters voted against the party in power indicating their aversion for the KWAM 1 team of Oyetola. For instance, deduct 254,345 from the total valid vote of 720,122. This is equal to 465,777! There will also not be need for extra time if the Oyinlola coalition was able to bring opposition parties to work together. But personal interest was greater than that of the state they want to rule. But now the boys have been separated from the men. In the extra time, the value of SDP candidate, Iyiola Omisore has increased as the beautiful bride with 128,049 votes. Imagine if PDP managed their internal-crisis properly and were able to retain Omisore, it would have been a needless contest. Victory would have ended during full-time. Although Omisore has accepted defeat, the extra time has transformed him into a critical stakeholder in the rerun election in polling units spread across Osogbo, Ife South and North and Orolu local governments. He may decide to play the spoilers’ game or dance either to the Hip-Hop of Davido in PDP or the Fuji beat of KWAM 1 in Oyetola camp. What of the ADP candidate with 49,744 votes? Many politicians overprice their popularity and live in fool’s paradise that they would win when they can only deliver some polling units. The foolishness of opposition parties displayed by actors in Osun is not new. The same foolishness was on display when Governor Abiola Ajimobi won his second term. The refusal of Senator Rashidi Ladoja to reach alliance with Adebayo Akala gave Ajimobi victory even though the sum of their votes would have given them a landslide victory. But with the twist of fate now in Osun state, those who refused to work together would now be forced to reach out to Omisore who seems to be the new bride. Unfortunately, the extra time will be a rerun of election vice on steroid. There will be more vote buying and the polling units where the rererun shall take place will be flooded with gifts. Surely, rerun voters will have more value/worth in extra time than those who participated on Saturday. Political scheming is ongoing. At this period in time, any alliance that can bring the most favourable results will be explored. APC will try to associate with SDP and will speak to Adeoti too. Promises will be made. It is also possible that voters may be intimidated to prevent them from showing up at the polling units. Depending on which side it occurs, voter’s absence will be a victory for one player. All we know now is that the fate of Adeleke of PDP and Oyetola of APC is to be decided by the decisions of 3,498 voters; that is if all of them come out to vote. It may be less. It is too early to say which way the pendulum will swing considering the dexterity of Nigerian politicians and what they are capable of doing. APC is now in a battle of face-saving while PDP is on a MUST win mission. But the two parties have great entertainers behind them who are getting ready to roll out the drums to the government house. In the build up to the election, came to support his uncle describing him as incoming governor while KWAM 1, adorned in APC attire, called for vote for Oyetola. What is certain is that the people of the State of the Living Spring are thirsty for a soothing spring. Whichever way it turns out, the Dancing Senator will both consolidate on his hanging victory and make it all real or Gboyega may spring a twist of fate surprise. One thing is sure: the victor on Thursday will not only be for the candidates but the people of Osun who are introducing new dynamics to Nigerian politics ahead of the 2019 polls and showing how the local affects and send jitters to national contenders. One more thing: Davido and KWAM 1 are set to play at the optimistic inauguration of their beloved ‘incoming governor’. Who will play between Davido and KWAM 1 at the inauguration of the next governor of Osun State? Their fates lie in the thumbs of 3,498 voters in the extra time. NOTE: This article was sent before the Osun governorship rerun poll. Who is afraid of Obono-Obla?